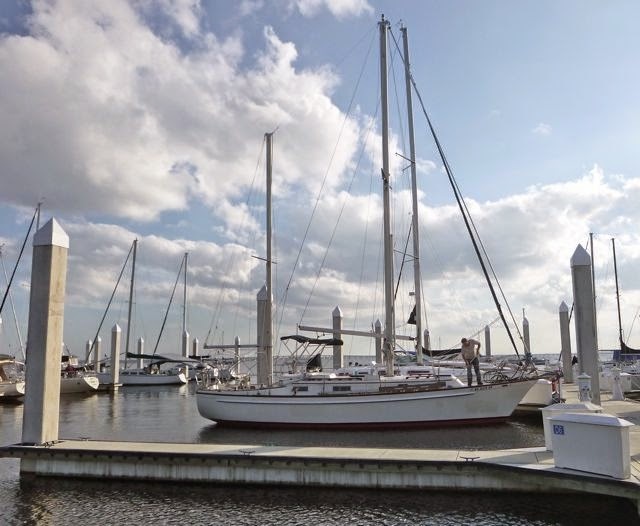 With naked sails and our boom lashed to the deck, on Saturday Wayne motored away from Green Cove Springs work yard under leaden skies, a chill brisk wind in his face. 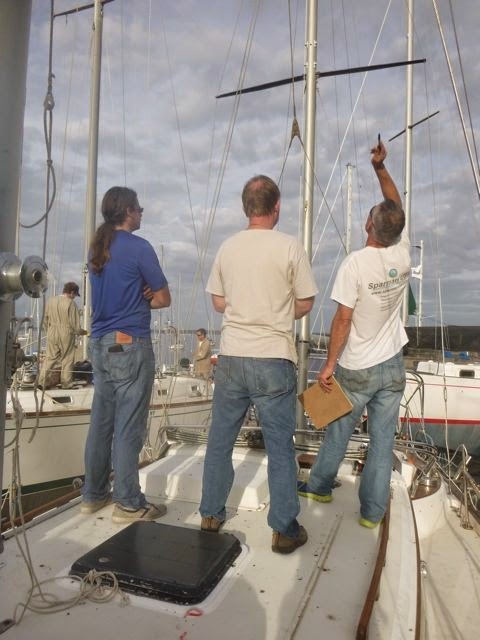 While he arrived safely at JAX NAS Mulberry Marina before dark, cruiser preparation was still in full throttle. Sunday marked our first baby steps putting Journey back in order to set sail for at 8,000 miles or more, and become our 150 square foot home for the next two years. Sunday sparkled with sunshine. I was roasting in my cold weather garb, totally appropriate for Saturday, and loving it. Pretty awesome for November weather. Julian scales Journey's mast. See him up top? Maybe March can be a lion or a lamb, but it's got nothing on November! 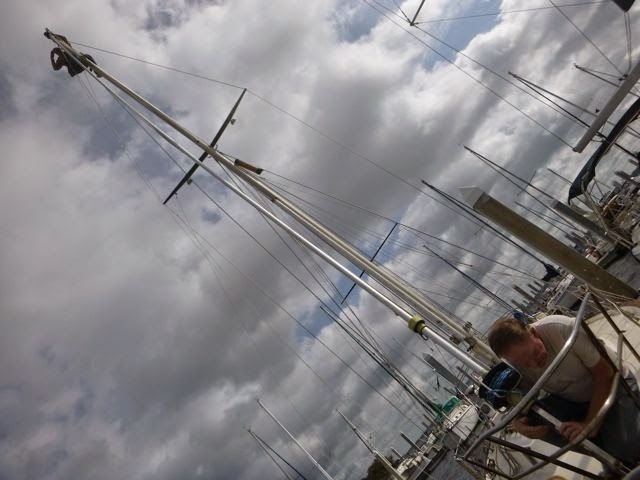 It started out beautifully balmy, ideal for the final touches in replacing the last bits of our rigging. Julian Crisp, aka "Sparman" worked us into his busy schedule and was motivated get the job done ASAP, which suited us perfectly. Bit by bit, the fluffy wisps of clouds became blobs and banks, while the wind and water whipped, swaying Julian to a fro, albeit not gently. WIthin three minutes after it was clear the base was on tornado warning and lighting was striking about a mile away, all Julian's tools were inside Julian's truck as the thunder, lightening and downpour struck. Whether the job was done or not, an incoming tornado was a jolly good enough reason to stop for the day! Julian "Sparman" aka mast monkey at work. And today, the next day, cold, clear but calm. Journey's rigging is ready to go. As someone who still remembers clearly a schoolmate racing a storm front to shore in a small boat when she struck by lightening and killed, two days before the seventh grade, I have an exceptionally keen respect for lightening. 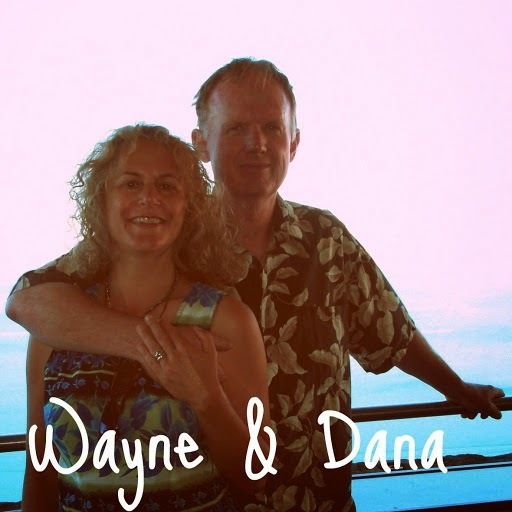 Thank you, Julian, and Wayne. 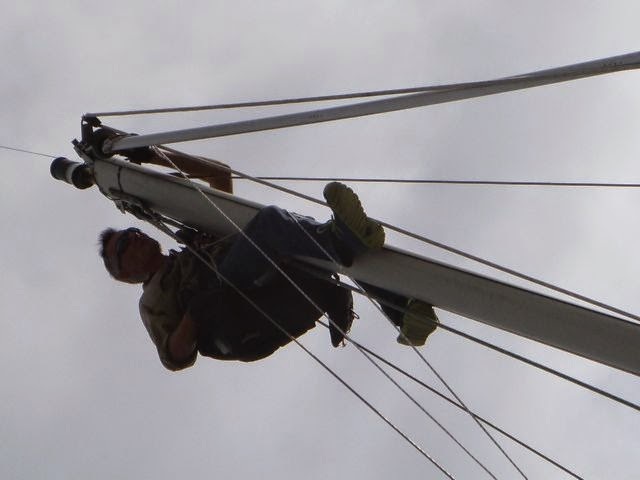 Normally, I enjoy being a mast monkey for simple jobs that don't require a lot of strength. This rigging work was anything but. Julian, I am especially grateful for your nerves of steel, and the good sense to get the heck outta dodge before it was too late. 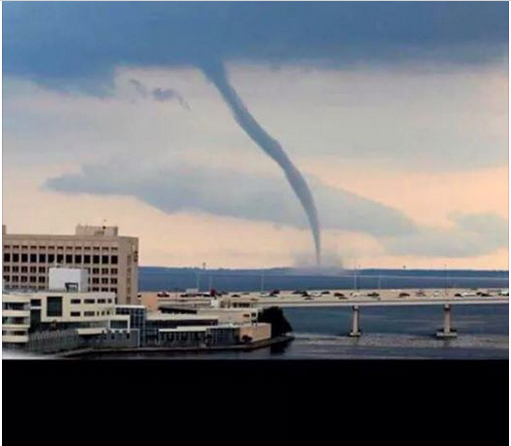 JAX NAS Mulberry Cove Marina.